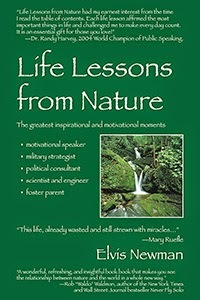 "Life Lessons from Nature" is an insightful book that examines the intersection of Mother Nature and modern human life for the purposes of improving ourselves and the world and living the best life. The author, Elvis Newman, writes of several lessons of inspiration gained from observing Mother Nature, specifically from the behavior of many different types of animals, from mayflies to mice to beavers and elephants. The author tells readers how to realize the hidden messages of Mother Nature that have given us inspiration for technological and scientific creativity, as well as information about military and political strategies. The approachable nature of Newman's writing and motivation for helping his readers achieve a higher quality of life is the book's greatest strength. In addition, Newman provides helpful and practical suggestions to achieve success and ample motivation in life, especially in the presence of challenges. Lastly, Newman pays homage to the beauty and wealth of the nature that surrounds us in a unique format by referencing the behavior of animals that serve as lessons we can apply to ourselves. This is a great book for readers seeking more motivation in their lives and who appreciate simple lessons that can be applied to many areas of life.